Hood River, Or – Every August brings the gift of a new hop harvest and the Full Sail Brewers wait with thirsty expectation. Dependent on nature’s timing, the brewers respond quickly to that eagerly awaited call from the hop farmer, gathering the fresh hops in their truck and speeding to the waiting brew kettle. 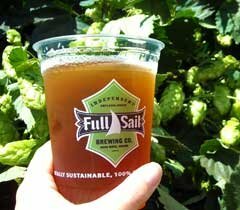 The beers that are brewed are an annual celebration of hops— Full Sail's Fresh Hopped beer. “As brewers we are always reliant on nature’s bounty, from the quality of the barley harvest to how the hops weathered through the Oregon summer. But no moment brings this relationship to sharper focus than our fresh hop beers. This year, we celebrate the season’s first hops with three different beers: Lupulin, 2 brews of ale each featuring a different hop variety, and Hopfenfrisch, a Pilsner lager, showcasing a third variety. All highlight the brewer’s art as well as nature’s gift,” said Full Sail Executive Brewmaster, Jamie Emmerson. According to Emmerson, each hop variety reaches peak maturity at a different time during harvest. “For this year’s fresh hopped beers we brewed three different batches waiting each time for the right hops. To highlight the unique flavor of the different hop varieties, we brewed two ale batches using the same malts, but different hops. The beer’s balanced caramel character and malt body really let the hops shine brightly through on the palate. The First Gold hops have a pleasing herbal character with hints of citrusy lime. The Centennial hops add a round, fruity orange and grapefruit citrus flavor. In the lager version, Hopfenfrisch Pilsner lager, we used fresh harvested Mt. Rainier hops, a close cousin to Germany’s famous Hallertau Hop, which give the beer a soft and elegant floral hop perfume. This pale gold aromatic brew was left unfiltered to enhance its smooth body and honeyed malt flavors. All those Mt. Rainer hops give the beer with a long, clean bitter finish.” All three hop varieties were locally grown at Goschie Farms, a Salmon Safe certified hop grower. Full Sail’s Lupulin and Hopfenfrisch are part of Full Sail’s rotating line up of Brewmaster Reserve beers. They will be available in limited quantities September to November on draught in pubs throughout the Pacific Northwest and at Full Sail’s Tasting Room and Pub in Hood River and at their Riverplace brewery in Portland, Oregon. They will also be available at various fresh hop beer festivals throughout the Pacific Northwest including the Hood River Hops Festival and the Yakima Fresh Hop Festival, both Saturday, October 2nd at the Oaks Park Fresh Hop Festival in Portland, Oregon, October 9th, and at Fresh Hop Festival in Eugene, Oregon, October 16.